Although I’m someone who enjoys photographing wildlife, I tend not to head out on walks actively looking for specific creatures in the kinds of places they’re likely to be found. I much prefer the spontaneity, surprise and randomness that any walk can provide, which means that when I do encounter something interesting I’m often caught off guard. I therefore have a growing list of elusive wildlife subjects I’d like to write about in this column, but haven’t felt able to because I wasn’t quick enough or fortunate enough to snap a photo to illustrate them with. Lizards have long been at the top of that list as they are something I used to see quite regularly over the summer months. Well, when I say ‘see’ I actually mean ‘caught a fleeting glimpse of something rushing off the path and assumed it was probably a lizard’. But in recent years I’ve forgotten all about them. That’s partly because I don’t do much hillwalking in summer any more and partly because lizards are very scarce at home in Fife. I just don’t see them. But day after day of working in the Cairngorms this summer has brought me back into contact with lizards. Well, when I say ‘contact’ I really mean ‘frequently hear things zipping through the tinder-dry grass, unseen, and assume they are probably lizards’. 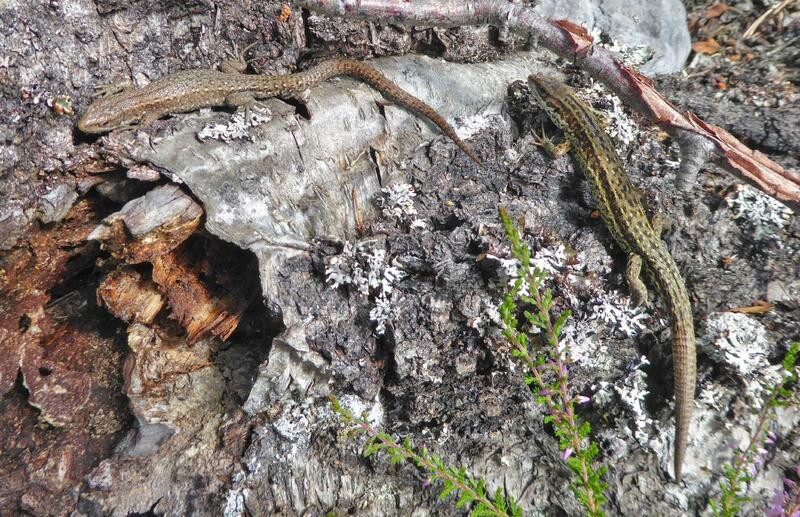 I’d forgotten what a staple feature of many a summer hillwalk lizards actually are. If not via actual physical sightings, then at the very least through those lightning movements in the corner of your eye or that sudden rustle at your feet. An article was beckoning but as summer wore on I still hadn’t had a face-to-face encounter with a lizard. Alas, no photo. Nature, however, occasionally seems to sense my need and rewards my years of patience with unexpected and intimate encounters that leave me incredulous at my good fortune. These chance encounters, where you happen to be in the right place at the right time, are undoubtedly the most satisfying and that’s exactly where I found myself a few weeks ago. But before I go on, I should first introduce our Scottish lizards and explain why they are, for the most part, elusive. There are five lizard species in the UK. Three are ‘native’ species and two have been introduced from overseas, but only the three native ones are found in Scotland. Of these, the slow worm looks like a snake but is actually a legless lizard, a phrase that tickles me because I can’t help picturing it stumbling drunken down a street. Though widespread, slow worms don’t come out into the open much so you’ll be lucky to see one. 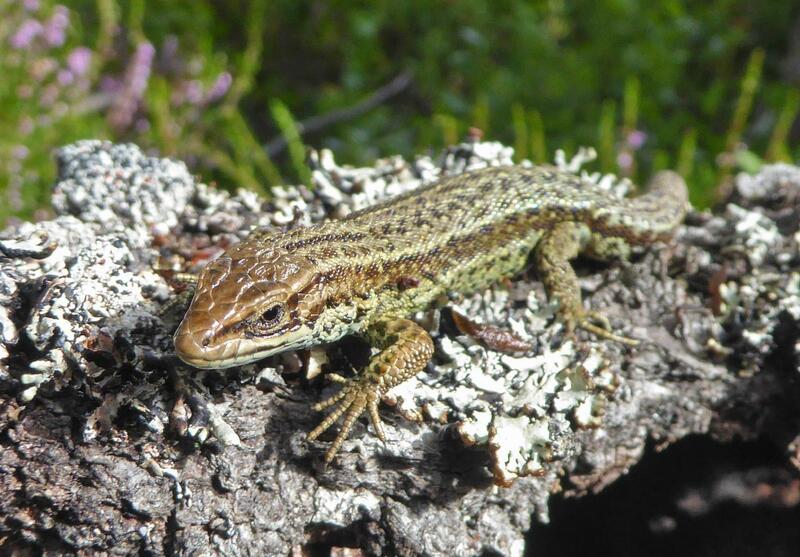 Next up is the ultra-rare sand lizard, which shouldn’t really be here at all, but 39 individuals were released onto the island of Coll as an experiment in 1970 and their progeny are still there today. That leaves the common lizard. At around 15cm long and obviously lizard-like in appearance, this harmless wee hunter is the reptile you are most likely to encounter. Absent from the Northern Isles and much of the Hebrides, it is widespread across most of the mainland but, set against a backdrop of general decline it is certainly not as common as its name suggests. It’s quite possible to spend a lifetime walking in Scotland without ever actually seeing one. Newt on the left, lizard on the right. The differences are striking when seen alongside one another. You’ll find common lizards in a variety of environments including heath, moorland, woodland and coastland, but they are restricted to places that contain a diverse ‘structure’ of mini habitats in which they can hunt, hide and hibernate. That means a mix of both long and short vegetation, with both sunny spots and dark crevices, and with the kinds of places that might contain lots of invertebrates to eat. Their elusiveness stems mainly from the fact that they are extremely flighty creatures. Your heavy footfall will not go unnoticed and at the first sign of danger they’ll disappear into the nearest undergrowth. That, incidentally, is one way to tell the difference between them and a superficially similar newt. Lizards tend to flee and can do so VERY quickly. Newts on the other hand, tend to keep still and if they do decide to flee you’ll barely notice, as they are slow and cumbersome on land. As amphibians, newts are much more toad-like in how they move their limbs. Common lizards have good cause to be nervous. They are prey for just about everything including weasels, stoats, cats, birds of prey and even adders. They therefore have superb camouflage and, while their colour and markings may vary they’re generally the same colour as the background vegetation. All in all you have a creature that is keen to stay out of sight and is very good at doing it. Unfortunately for them, but fortunately for us, they must risk their lives by coming out into the open in order to warm themselves up. 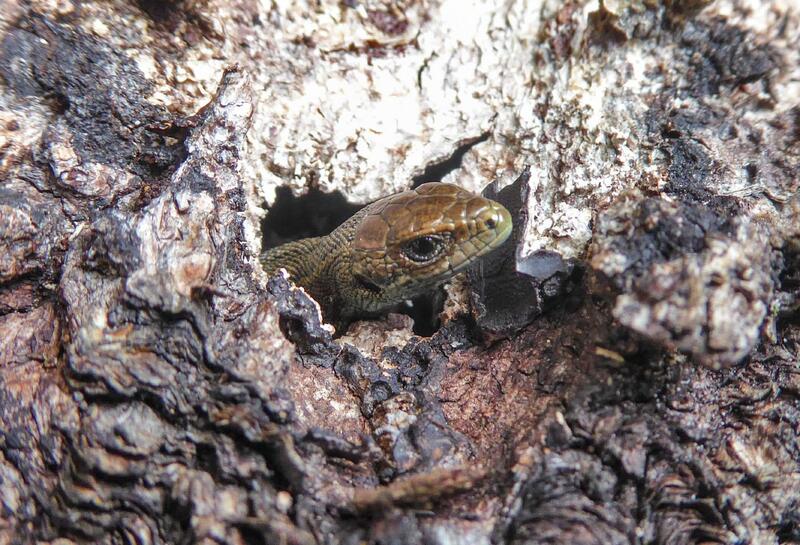 Like all reptiles, common lizards are ‘ectothermic’, meaning they cannot generate their own heat like we ‘endotherms’ do and must instead ‘thermoregulate’ themselves. This involves using their surroundings in order to raise their body temperature to an optimum of around 30C. They can still move when cool, but they’re likely to be sluggish. Thermoregulation doesn’t have to come from direct sunlight, it could just as likely come from contact with a warm surface, but certainly the sunbathing moments offer your best chances of seeing them. However, while you might think that those hot summer days we’ve enjoyed were the perfect time to see them basking, reptiles are still susceptible to overheating and on very hot days will seek out cooler nooks and crannies to lower their body temperature. We’d headed out early to undertake an ecological survey of natural tree regeneration in Glen Quoich. On this particular summer morning it felt quite cool, as the dawn temperature of 4C was the lowest we’d had in months. We were half way up Creag Bhalg on the edge of the birch woodland, amongst deep heather and blaeberry tussocks, with lots of deadwood lying on the ground. I was laying out the tape measures and just happened to step over a large log when I noticed movement on its flank. A teeny tiny hatchling head! On first glance there was nothing there and I thought nothing of it, but as I stepped back from the log to further extend the tape measure, an adult lizard emerged from the log’s underside. I was just a metre away and watched as the lizard confidently manoeuvred itself into a sun-kissed spot on the log’s upper surface. Its boldness surprised me and I called my colleague over to take a look. As he came closer the lizard again fled to the log’s underside, at which point I thought that was the end of the encounter. But seconds later it re-emerged and settled back in the exact same sunny spot. I crouched down and gave the lizard a closer look, my face now only half a metre from it. I instantly got that wonderful feeling of elation that comes when a creature allows you to get close to it on its own terms. Even if lasts just 10 or 20 seconds, you can notice more in that short time than in a whole lifetime of fleeting encounters at distance. In this case, its beautiful markings stood out. It wasn’t a dazzlingly exotic colour, just light brown on top and pale brown on its underside, but close up you could see the various hues of its individual scales. The lighter ones forming two lines down its back, the darker ones forming spots at regular intervals. They intricately overlapped like slates on a roof, getting larger down its legs and then smaller again to the end of its long shapely toes, each one ending in tiny wee claws that tightly clasped around the bumps on the log’s surface. Behind its front legs, its sides puffed in and out as it breathed. Strong and obvious but also erratic, coming in waves rather than keeping a regular beat. It blinked, which took me by surprise because I’d forgotten that, unlike snakes, lizards have eyelids. It was interesting to see how it was pressing itself hard against the log and flattening its body slightly outwards, presumably in order to increase its surface area and thus warm up quicker. And it occasionally adjusted its head in order to angle its watchful eye in my direction. Look closely and you can see the wean shedding its skin in both pics. Yep, eye to eye with a common lizard. It would have been a memorable encounter in itself but, as I crouched there something else caught my eye maybe a foot further down the log. A teeny tiny lizard head, much smaller and a darker brown than the one I’d been looking at, was peering just 1cm out of a hole. Equally bold, it then crawled out of its hole and started scurrying about the log’s surface. I honestly couldn’t believe it. At perhaps just 5cm long it was a hatchling, a baby lizard! I had never, ever seen one of these before and might never again! My attention instantly switched to the youngster, shortly after which a second hatchling came scurrying along the log before disappearing into the same tiny hole that the first one had emerged from. How many more were hiding in there? This log was alive with lizards!! If nothing else it certainly served to remind me just how important deadwood habitat is in the landscape. The common lizard gives birth to up to ten or so young, and in this country it does something that its counterparts in the southern extremes of its range (and indeed most lizards) don’t do. It gives birth to live young rather than eggs, which is thought to be because of the difficulty in incubating eggs in colder northern climates. Indeed its other name is the Viviparous Lizard, which comes from the Latin ‘Vivus’ (meaning Alive), and ‘Parus’ (meaning Bearing). ‘Common lizard’ is the more usual name but it retains its other moniker via its scientific name, Zootoca vivipara. The young are born fully formed and, as far as I’m aware, have to fend for themselves thereafter. One of the youngsters on the log finally kept still long enough to inspect it and it was fascinating to see that it was already shedding a layer of skin, which looked like opaque sticky tape stuck around its feet and tail. We barely had time to take the scene in before we noticed yet more movement to the right, as another adult boldly scrambled up to join the party. This one was longer and stockier than the first, almost green in colour, and was equally keen to bask on top of the log while we watched. I didn’t notice it at the time, but looking at a photo now, the end half of its tail was a different colour to the rest of its body and had different markings. I wonder whether that meant it had lost and re-grown its tail at some point? Common lizards can certainly do that if they’re grabbed by a predator. The tail is shed and carries on twitching in order to distract the predator and let the lizard escape. The tail grows back but never looks the same thereafter. Basking in the sun. Both the same species but note the differences in size and colour. Clearly I would happily have sat there all day watching lizards, but this was work time and we needed to crack on with our survey, so I reluctantly stepped away and resumed my duties, rightly incredulous at my good fortune. By the end of the encounter there had been at least four lizards on or in that log in front of me and I couldn’t get over how calm and obliging they’d been, nor how quickly they’d all returned to the log surface after being disturbed. No doubt it was all entirely logical from an ecological sense, being something to do with it being early morning, it being the first sunlight of the day, and the lizards knowing full well where the choice basking spots were. Still, given I’d spent the whole summer up to that point snatching only fleeting glimpses of lizards as they’d scurried for cover, to be treated to a veritable lizard parade as summer came to a close was so much more than I could have ever hoped for. The right place, the right time indeed!